At a time when grandeur seems to be the new normal, I think some of us are looking for that change. Simple. 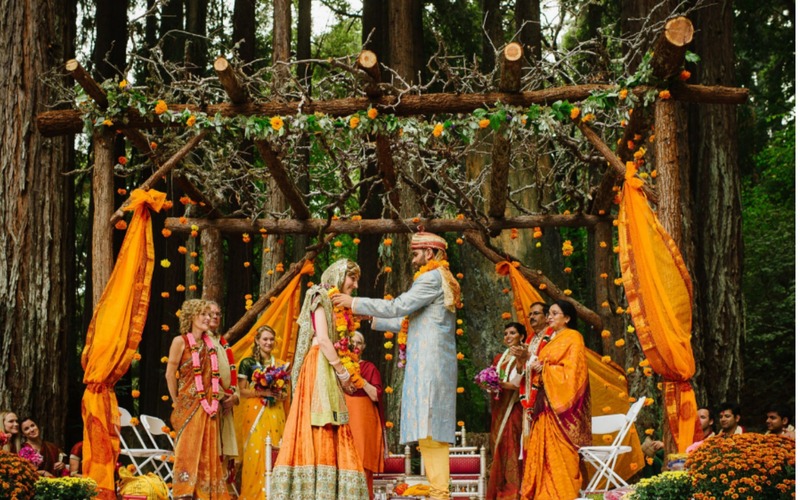 No complications, just a simple Indian Wedding. Is that even a possibility? I want to believe it is possible and acceptable by some. For those some of you, I thought let me draft this post on my thoughts about it. In my whole wedding engagement fiesta, I had a budget wedding for those of you new to the blog. But even in that budget, I had stretched beyond my means to have every little function, dhamakas, and the shor sharaba of a ‘typical’ wedding saga. I can’t tell for sure if I wanted it all, but I went ahead with it. Call it social pressure, or the new normal…I just went with the flow. But looking back, I think the most meaningful of the wedding functions was my engagement ceremony. We didn’t pressurize ourselves too much, and the end result in my eyes was beautiful. I had a temple ceremony with just the two families, and some extended relatives + some very close friends. I remember till date every single emotion I went through those magical moments. That beautiful March morning, with the sun shining bright, all eyes which mattered on me when I walked in, the tears of joy and pride in my parents and grandparents eyes, the acceptance I saw in my new family…gives me goosebumps even now. Its not like I don’t recall my wedding memories, those were beautiful too…but my mind was running a thousand thoughts…”Am I looking alright…has the photographer got the right click, is everything going ok at the venue“. Sure some of you might say that shouldn’t be of my concern…but it was my concern. I spent months planning it out, working to every single detail and I wanted things perfect. But perfection is an illusion and a big one at weddings ! In the end, my memories are distorted with things that didn’t fall in place, things that could have worked out for the better and blah blah blah. Coming back to my point, the engagement ceremony was a bigger ‘success’ for me personally because I had it in a temple, and there is only that much that one can do. Don’t get me wrong, the location was spectacular, natural beauty and all that, not a single decor nonsense done and viola, I still have family and folks talking about how beautiful the ceremony turned out to be. Shouldn’t that be the whole point? I know letting go of all the fun wedding functions and elements is a strict no no, but for those of you wanting something different, something less complicated…here’s a list that can help you to achieve it. There are lot of other aspects that one needs to think about when it comes to weddings. Be it gold, or food, caterer, accommodations etc etc. The list is infinite if you start putting things down. But the trick is to not get hassled and dragged by what everyone says is the right thing to do. Back in my day, I felt so pressurized when I met outfit store people, vendors, friends and extended family. Everyone had their two cents to give about the ideal scenario of a wedding. But honestly, its just you who has to pull through the wedding. Its your money, your day, your wishes. Just honor that and you will have a beautiful wedding that will be full of rich memories. Would you rather? Wedding Lehenga vs. Photographer !